California has always been a fashion trend setter in terms of style, architecture, and of course movies. 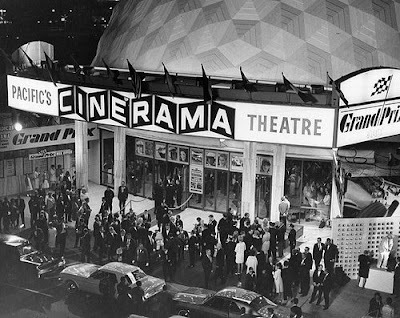 Here at the Cinerama in Hollywood all three came together in this picture which I think is from the 1950s - around the time setting of the film "American Graffiti", the George Lucas piece that defined the 1950s for a new generation of Americans and started the careers of stars like Harrison Ford and Richard Dreyfus. 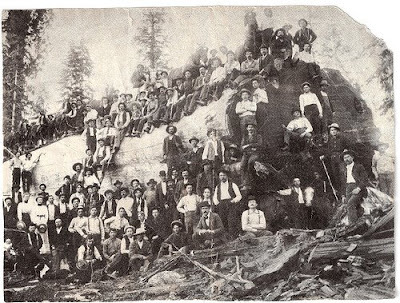 People and Horses on a Gigantic Redwood Log; about 1900. I'm not sure but think this is a Giant Sequoia rather than Coast Redwood. The Giants tend to be of greater diameter but not as tall as the coast redwoods with bark that is flatter and less furled. Also, the area appears very open where the Redwood forest is generally lush with smaller plants and trees. That said, Giant redwoods never represented the huge market of the Coastal Redwoods which were a mainstay of the northern California economy for decades, until protections and depletion of the resource stemmed the tide of logging the Redwoods. Although a small fraction of the original "Old Growth" Redwood remains and some is still getting logged, scenes like this will never again be a part of the historical landscape.